One of the hardest sets of 6 miles I've ever done. Starting at 8,075 ft. in elevation up to almost 9,000 in the first three miles this was exhausting to say the very, very least. To be honest it took every bit of pride and ego to turn right for the continuation of the 10k. Left would have been the easy way out on the 5k return loop. I finished in 1 hour and 19 minutes with nearly all the extra time added from the sheer exhaustion caused by the elevation and the added weight strapped to your feet. I learned a lot of little tricks for the next race, like not wearing hiking boots and a few others on some layers and pants, etc. Kahtoola gave out some great prizes and I went home with a big jug of Heed drink powder. Two people went home with $250+ sets of Kahtoola snowshoes. Really small event, only about 30-40 people at the most but all really great people with some incredible stories. One 76 year old woman had just done the Boston Marathon last fall and she was sure this was tougher! 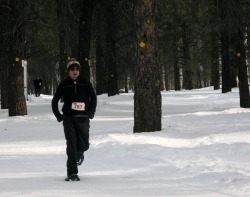 The third and final race in a winter series sponsored by the Flagstaff local outdoor company Kahtoola. The first being the snowshoe race I attended at the Nordic Ski Center and the second another 10K Snowshoe race at Mormon Lake Jan. 30th. This is a two or four person team race 1.5 miles straight up Agassiz and then turning around and burning straight back down. Fastest total team wins. In a full snowstorm leaving Agassiz lodge we ran horizontal for a few hundred meters before the climb began. 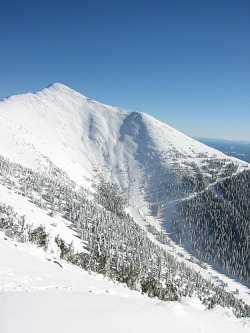 Straight up the mountain. Straight up. The climb went on for a mile before leveling off. The entire climb was steep with a good portion requiring kick stepping into the snow. Looking back there was just a line of people coming up the very same path up the mountain. Once we leveled off it was a few hundred meters of horizontal running before the sprint down the mountain began. I picked up my pace on the flat and passed four people before dropping into the downhill. A steep decent right off the bat and the snow was flying so you could bearly see in front of you. I starting sprinting down, using the momentum of the mountain to push me faster. My spikes bit into the snow but I was sinking in with each step and it was never good footing. I nearly fell or rolled forward many times. I passed two people on the mile down the mountain and nearly caught a couple more. I finished in 41 minutes (leader finished in under 31) good for 21st place out of 120. It was also the fastest on our team, Clay finished 7 minutes later and Mike came in injured 20 minutes later. Our team average was good for 12th as a team even with Mike's injury. The elevation was a major slowdown for me but other than that I felt great the entire time and the event was a lot of fun. Live band afterwards and a huge raffle with Kahtoola as always!